I started 2017 with a large set of dividend checks from my portfolio of companies. 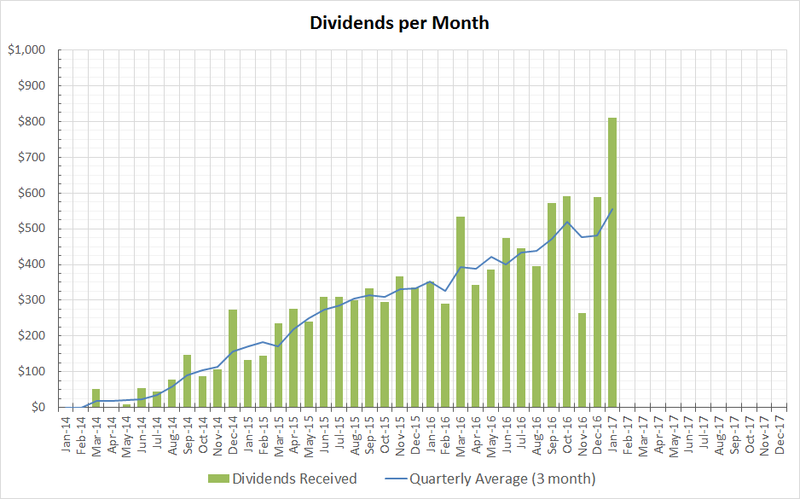 This month by far is the largest in terms of dividends received, largely because of my weighting in Altria and Philip Morris. All dividends were reinvested except Nike (NKE) since that is no longer in my portfolio due to 2016 tax loss harvesting. I have three accounts currently: my main taxable account, my Roth IRA which doesn't have very much, and my employer's 401k. If I were to leave my employer, I would transfer the 401k funds into a Traditional IRA and have it stored in my preferred broker. My employer's self directed brokerage does not offer very good service and the interface is terrible, but at least they let me buy individual stocks instead of restricting me to only index funds. I received a meager $15 of interest this month because of my House down-payment cash fund held in a 1.05% savings account :) I can use that to buy two hamburgers. The graph indicates my monthly dividend moving average is slowly climbing upwards. Eventually these payments will allow me to pay for my living costs so I no longer have to worry too much about having a job to survive. When my passive income starts crossing my monthly living expenses, that will be my turning point to financial independence. In the mean time, I am trying to funnel as much money as I can from my paycheck to passive income generating sources. January, April, July, and October are my largest dividend paying months. In a given quarter, certain months will receive substantially more than other months because of the way I weighted my portfolio. I try to look at my income on a quarterly moving average basis instead of a monthly basis to tune out the noise. Check my Dividend Calendar page to see how much dollars I plan to receive going forward for each month of the year. Very nice month for you to start the year. Congrats and thanks for sharing. That graph is looking really nice. It is following an upward trend which could only mean good things for your future. 800 in a month is nothing to scoff at for sure! Awesome start to the year. You have that snowball moving in the right direction. Great way to start the year. Been seeing a lot of positive growth among our fellow investing peers. Curious to know why you let NKE go instead of continuing to hold longer term. Thanks for sharing. Amazing way to jump start the year. Watch out for your concentration in Tobacco, as MO/PM fulfilled quite a bit of your income this month. Great companies, obviously, but just an observation. Cannot believe, by the way, you generate so much damn income from O! It's awesome. Keep it up. Awesome stuff YD. Over $800 across all your accounts is a great total. I have to say it's good to see that lots of your January payers are companies that I want to add: MO, MKC, SYK, ADP if I can ever find them at good valuations. SYK and MKC are pretty close but the other 2 are way too expensive for me to buy right now. It'll probably be a situation where I'll have to make sure I have cash on the sidelines so I can load up during the eventual downturn. Looks like 2017 is starting off with a bang for you.